Defense Minister Song Young-moo on Tuesday vowed to conduct a thorough investigation into the allegation that the Defense Security Command drew up a plan to impose martial law during massive protests against former President Park Geun-hye. 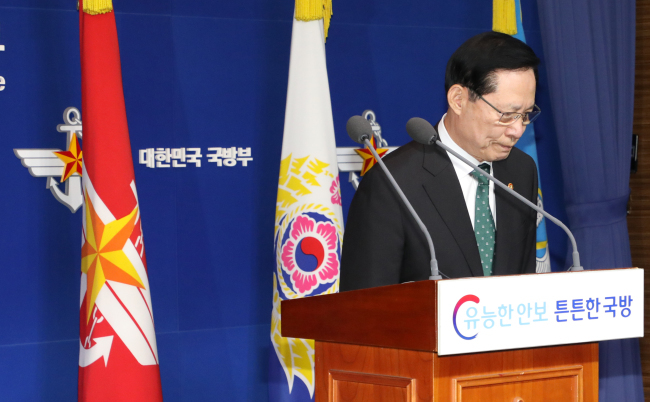 In a televised press briefing, Song Young-moo said the ministry will soon establish an independent investigation panel, noting the investigators will have unfettered authority to find any wrongdoings of the Defense Security Command. Song’s remark came hours after President Moon Jae-in ordered a special probe into the Defense Security Command, which is accused of drawing up a plan to impose martial law in March last year, when South Korea was waiting for the Constitutional Court’s ruling on former President Park’s impeachment. According to the document titled “Wartime Martial Law and Joint Action Plan,” the security command said they could consider declaring martial law in the event that anti-Park protestors force their way into the presidential office Cheong Wa Dae. The document also detailed a procedure for declaring martial law, including appointing the defense security commander as a garrison commander to mobilize troops. The document was submitted to then-Defense Minister Han Min-goo by then-Defense Security Commander Cho Hyun-chon. “I understand there is widespread suspicion among the public about the issue surrounding the Defense Security Command. … Considering the seriousness of the issue, we will conduct a thorough investigation,” said Song.